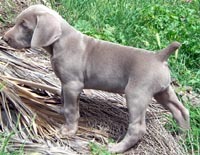 Weimaraner breeders links and breed information on pups4sale.com.au. pups4sale testimonial: Great site. Easy to use, incredible assistance with even the slightest problem and great exposure at a remarkably reasonable price - 1/4 of a similar newspaper ad. If we have another litter, I wont waste time / money on newspapers - I will only use your site.We found really great buyers and I have told everyone I know to go to your site. There is a lot to like about the Weimaraner, but most people point to their elegance and their hunting abilities as their top characteristics. They are able to hunt so well because of their athleticism and their extremely powerful noses. They are very alert dogs, which is obvious to anyone who has seen this breed's eyes, but their speed and intelligence is what makes the Weimaraner very popular all over the world. Weimaraners are slenderly built, but they are considered a large breed. Even though they are pretty skinny, they are full of lean muscle, which makes them very agile and extremely fast when running at full speed. 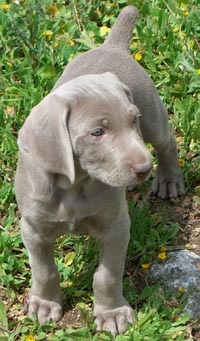 Thanks to Hanson Weimaraners for the pictures of Weimaraner puppies and adults used on this page. Weimaraners have wide eyes that are bright blue when they are puppies, but change to a bright yellow when they reach adulthood. The yellow color and the fact that Weimaraners are alert dogs can sometimes give them an alien-like look.Male Weimaraners get grow to be anywhere from 24 to 28 inches tall and can weigh between 55 and 75 pounds. Females are a bit shorter and top out at about 25 inches tall and they usually weigh five or ten pounds less than the males. 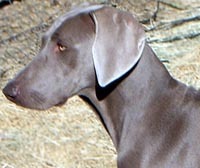 Owners usually point to the Weimaraner's coat as one of the reasons they really like the breed. It is short, silky and stays very clean throughout the year. 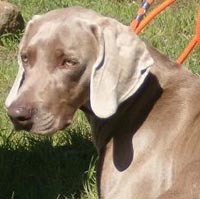 As far as color goes, Weimaraners usually have some variation of gray in their coat, but some have more of a brownish color. Weimaraners are friendly with just about everyone they meet throughout their lives, but they are also hard working dogs because of their intelligence and willingness to please their owners. They absolutely love to run around as much as they can, but they also like to relax at the end of the day if they have gotten the exercise that they need.Some people call the Weimaraner the “dog with the human brain” because of how smart it is and because it always wants to be doing something. This can be a great thing for owners, but it can also be a bad thing because Weimaraners will sometimes steal treats or find another naughty thing to do around the house. They have become known for outsmarting their owners more than most other breeds. Weimaraner puppies are as cute as can be, but they are also stubborn. This means that owners need to train them early to get them past any bad habits as quickly as possible. They are very playful as pups, but they need to be taught to control their vast amount of energy early on so they don't become destructive.Weimaraners are very calm and gentle around children, which is why they are considered to be great family pets. However, parents should keep an eye on them when they are with the young ones to make sure that they don't jump around or become too excited.Weimaraners do have an alpha dog personality, but they are usually good with other dogs and other animals as long as they are socialized early on in their lives. They are natural hunters, though, so it is not uncommon for them to chase small animals that they see out in the yard. For this reason, it is not recommended that owners keep rabbits, guinea pigs, or other small pets in the house with a Weimaraner. Weimaraners aren't aggressive animals, but they actually do make good guard dogs because of their loyalty to their owners. They will do anything to protect their families, so they will let strangers know that they are there by barking, and will even go as far as attacking someone that they think will harm their owners. Weimaraners are not good dogs to leave alone for too long because of how active they are and because they are smart enough to find something to do around the house. However, as long as they get all of the exercise that they need every day, they can be left alone for short periods of time. Weimaraners are highly energetic and very stubborn, so it is very important that owners start training early and make this breed know who is in charge. 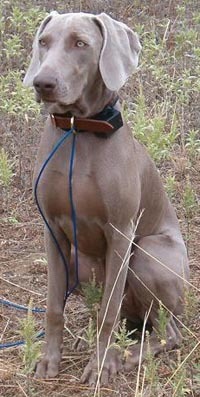 As soon as a Weimaraner knows who is in charge, which can take a while for them to get, training can become a lot easier for the owner and the dog.What's great about this breed is that once they have been rewarded for doing something the right way, they quickly learn to repeat those actions. They will do anything to please their owners, so once that bond has been created, training becomes pretty simple. One of the more important things that every Weimaraner must learn early on is how to go on walks properly. Their instinct is to lead, so they will pull if not taught correctly. This is why it is recommended that owners use a short leash to teach their Weimaraner puppies to stay next to the owner.Some owners find that socialization training to be the most difficult with Weimaraners because they get so excited around other animals. This, combined with their pack leader mentality, can make training them to be calm around other dogs pretty tough. This is why it is imperative that they learn at a very young age to get along with other animals. Weimaraners have a ton of energy, which is why they need as much room to move around at home as they can get, and a lot of time outside each day so they can run around. If they don't get the exercise that they need, they can become very cored and frustrated, which can lead to them barking incessantly or even destroying things around the house. These dogs were bred to use their energy to hunt, so owners should allow them to use their noses as much as they can while out on walks and jogs. They want to feel like they are doing something, so owners who allow them to feel good about the work they do will have a higher chance of having a happy Weimaraner. Are Weimaraners the easiest dogs in the world to groom? Well, there are plenty of owners who would say that they are. They have very short coats that seem to stay clean no matter where the dog goes, so baths are kept to a minimum and they rarely smell bad.The two things that owners should focus on as far as grooming goes are nail trimming and brushing their teeth. Weimaraners usually need their nails cut once every two weeks, which can ensure that they feel comfortable when walking or running on any surface. Brushing their teeth regular will keep Weimaraners from ending up with tooth decay or smelly breath. Weimaraners don't need any type of special grooming needs, which is just one of the many reasons why they are so popular. However, like with any other breed, they should be checked all over for any type of potential issues. Weimaraners are very healthy animals, but the one health concern with all deep chested breeds is bloat. This occurs when their stomachs twist and anything in their stomach gets trapped. Any dog that gets bloat must be taken to a veterinarian immediately because it is a life threatening issue. Most Weimaraners live between 11 and 14 years, but some can live a bit longer than that. Owners can help Weimaraners to live long, healthy lives by feeding them correctly and knowing how much exercise they need throughout their lives. Patient people who are willing to take the time to train a young Weimaraner all the way into adulthood will be the best matches with this breed. The most important thing that a Weimaraner needs is time to spend with their owners both inside and outside of the house, so that is something that owners simply have to give to them. While Weimaraners can be happy in most environments, people who live out in the country are considered to be the best fits. This is because Weimaraners love to roam around and use their powerful noses to keep their minds occupied. Again, it is not necessary that they live in the country, but they need as much time outdoors as possible so they can feel like they are working. Owners that can give them that will find that they have mentally healthy dogs. People who live in smaller apartments aren't usually good matches for Weimaraners because they would need to make up for the small living space with additional time outside. Most people just don't have the time to do that, so it is not a recommended breed for people who don't have at least a medium-sized home with a backyard.Anyone who prefers to keep their dogs in a kennel will not work in those conditions. They are the type of dogs that need space to move around and will become very frustrated in any type of kennel. However, they are happy to spend some time along out in a field or in a big backyard as long as they know their families are nearby. Weimaraners are beautiful dogs that can become all-around fantastic family pets when brought up the right way. They are bundles of energy, but their intelligence helps them to use that energy the right way. There are very few dogs that compare to the Weimaraner, which is why there are so many Weimaraner owners who won't get any other breed.